And Vidas has just noticed there’s a new release of PowerPivot that integrates with Windows Azure Marketplace – Microsoft’s data marketplace that was previously known as Project Dallas. One last thing to note – among all the cool data that’s available at the Windows Azure Marketplace, I see that you can get access to data from Wolfram Alpha too! 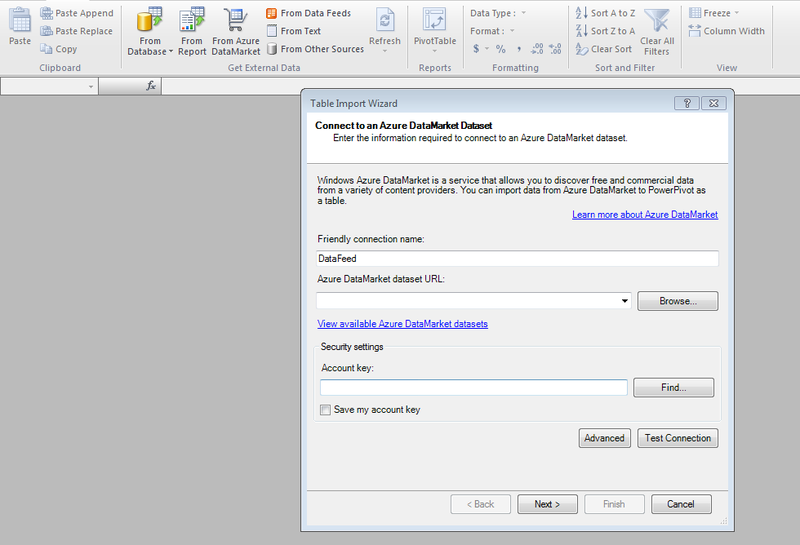 Basically it’s the SSRS you know and love with only a few limitations: for example it only supports SQL Azure as a data source and there’s none of the developer extensibility options (like custom data extensions) available yet. What I’m doing here is to taking the set of all Products, then using the Generate function to crossjoin each Product with the set of all Products from the And Product dimension, starting from the And Product that’s immediately after the And Product that has the same name as the current Product, to the end of the level. So what we have here is essentially a Product dimension table, a Customer dimension table and a Sales fact table. 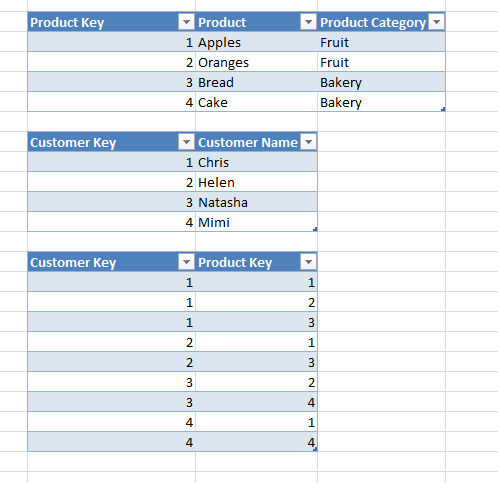 I did the obvious thing and set up relationships going from Sales to Product and Sales to Customer, but I also created two extra tables in PowerPivot that were built from the Product table: one to allow the selection of Products for the AND filter, and one to allow for the selection of Products in the NOT filter, neither of which were related to any other table. So when building the query to show the number of customers that bought Apples and Oranges but not Cake, the user would select Apples on the Product table, Oranges on the AND Product table and Cake on the NOT Product table. They both work in the same way: they find the distinct count but shift the context on the Product table (which has a relationship with Sales remember, whereas AND Product and NOT Product don’t) so that whatever has been selected on Product is ignored and, the selections made on AND Product and NOT Product are, respectively, used instead. 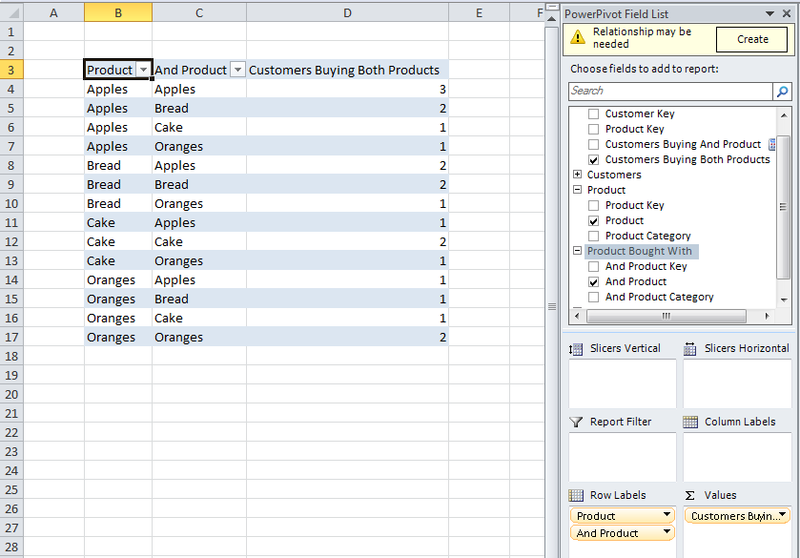 To do this I’m using two nested filters – one which loops over every row in the Product table, and then an inner filter that loops over every selected member on AND/NOT Product; they return the rows from Product where the Product Key appears in the list of distinct Product Keys selected on AND/NOT Product. It’s a variation on the original distinct count measure, but now we’re using Calculate once again to shift the context so we take the distinct customers and apply an additional filter to ensure they didn’t buy whatever was selected on NOT Product but did buy whatever was selected on AND Product. As always I’d be interested in hearing from anyone that’s got a better way of solving these problems. I’m aware I’ve used the evil Filter function all over the place and that that isn’t always good for performance (although on larger data sets this approach seemed to perform ok) so I wonder if there’s a way to avoid its use anywhere? There’s no way I could ever pretend to be an impartial reviewer of Marco Russo and Alberto Ferrari’s new book, “PowerPivot for Excel 2010: Give Your Data Meaning”. First of all, they’re good friends of mine (we wrote “Expert Cube Development with SQL Server Analysis Services 2008” together last year); and secondly, I got a freebie copy of the book. But all that aside, I do honestly think it is a really good book. 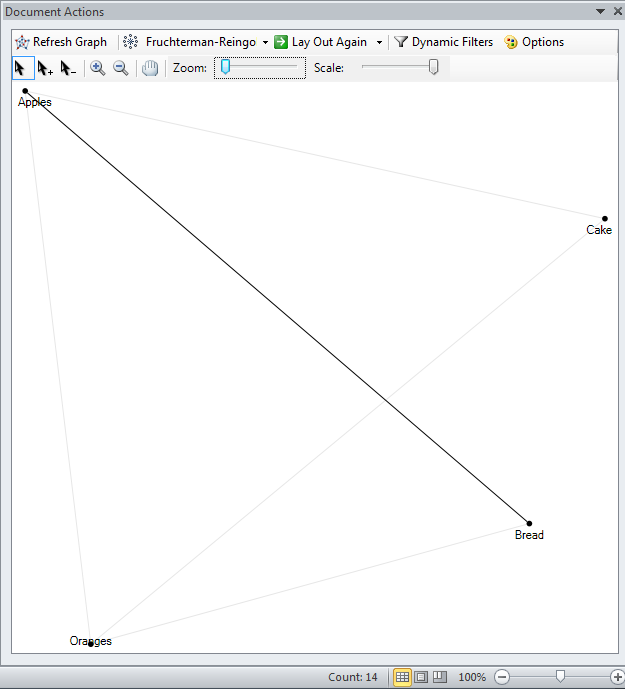 Just as an example, I’ve been playing around with some DAX problems over the last few days with a view to writing a some blog posts and had been struggling to get the EARLIER function to work in the way I’d been expecting; there are only a few examples of its use on the web but I found the book had a very detailed explanation of how it works. Indeed a large part of the book is concerned with DAX and it’s probably the best resource on that subject that I’ve seen, so that’s reason enough to buy it. It’s important to point out, though, that Marco and Alberto’s book doesn’t really go into any detail on PowerPivot for Sharepoint – there is one chapter at the end, but it’s main focus is on PowerPivot for Excel. If you want to learn more about the Sharepoint side of things I can recommend “Professional PowerPivot for Excel and Sharepoint” by Siva Harinath, Ron Pihlgren and Denny Lee (and yes, I got this book as a freebie too – it’s one of the perks of being a blogger that you get loads of free books!). There’s very little overlap between the two books – the only thing they both cover is the basic info on how to build a PowerPivot model, and that subject is so basic most people will be able to work it out for themselves – so it’s probably worth getting both if you’re serious about learning PowerPivot.